Oscar, a New York-based health insurance company, has announced an operational expansion to Tempe, Ariz. The company’s new facility will house the Oscar Concierge team and will be located at The Circuit, a new modern, adaptive re-use project near the Loop 101 and Loop 202 freeways. Oscar is a new kind of health insurance company designed to put people first. Through a high-tech, data-driven approach, easy-to-understand language and a unique set of benefits, Oscar is drastically changing the way people think about and interact with their health insurance. Founded in 2012, Oscar makes health insurance simple, transparent and human and now offers plans in New York, New Jersey, Texas and California. After a competitive process, Oscar selected Tempe for its newest location after working with economic development representatives from the Greater Phoenix region, including the Greater Phoenix Economic Council, the city of Tempe and Arizona Commerce Authority. 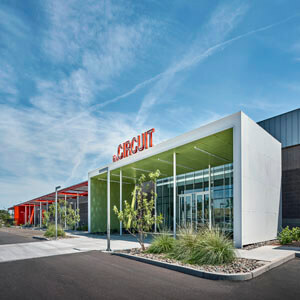 The region’s large, skilled workforce, high quality of life and pro-business climate and creative office space options like The Circuit were attractive draws for the company. The Circuit is EverWest Real Estate Partners’ newest adaptive re-use project. Built in 1982 as a semiconductor building, The Circuit is an ultra-modern, 185,000-square-foot high-density office project designed for large office users looking to attract active professionals to a creative environment. Building features include a collaborative indoor-outdoor layout enhanced with 17-foot ceilings, 14-foot floor-to-ceiling windows and more than 60 skylights to maximize natural light.